Angelo devised his Ten Lessons at the request of one of his patrons, Colonel Charles Herries, founder of the Light Horse Volunteers of London and Westminster regiment. Colonel Herries found the lack of sword training and overall fitness of his Volunteers to be troubling and requested his friend Angelo to find a solution. Angelo was already a master of the smallsword, but he also trained single-stick regularly with his good friend, James Perry, proprietor of the Morning Chronicle newspaper and native of Aberdeen, Scotland, who happened to be serving time at Newgate Prison in London for libel against the British House of Lords. Perry was an excellent single-stick fencer, which was a game involving a sword-length stick with a woven baskethilt attached to protect the hand. Fencers would attempt to strike the opponent on the head to make it bleed. The sport was quite popular at county fairs as a regional competition amongst towns and villages (and at one time was a sport in the Olympics). Perry and Angelo would use the top of the prison to practice their version of “Highland Broadsword” fencing and this inevitably provided the basis for Angelo’s 10 Lessons of Highland Broadsword. Angelo presented his Ten Lessons to the Light Horse Volunteers of London and Westminster in 1798 [sic]. 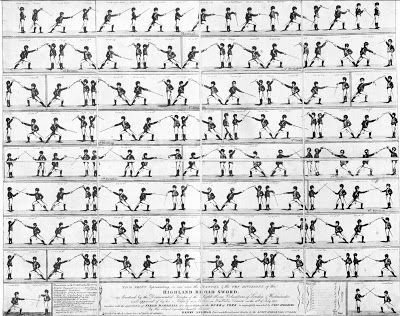 The aforementioned Col. Herries wanted a system of fencing to provide both military instruction and physical training to his new recruits. Angelo’s easy-to-understand Lessons fit perfectly, and it became the standard sword drill for generations of English recruits for years to come. In modern times, students seeking to learn to fence with the Scottish Broadsword start with the Ten Lessons to familiarize themselves with the weapon and the concepts necessary for proper use. In 1799 Angelo the Younger published a large print (56 x 39 cm, 22″x 15 3/8″) illustrated by his long-time associate, Thomas Rowlandson entitled The Manual and the Ten Divisions of the Highland Broad Sword. Angelo’s sabre system was beautifully illustrated by Rowlandson through a series of dramatic and romanticized plates in a publication the previous year, Hungarian and Highland Broad Sword (1798). This prior publication consists of twenty-four plates with a notable absence of verbal description, save only brief image captions. Hence, a practitioner is hard-pressed to discern a system of swordsmanship with the requisite intricacies. “Cut One, and Thigh Protect. New Guard.” One of twenty-four plates from Henry Angelo’s “Hungarian and Highland Broad Sword” designed and etched by Thomas Rowlandson, 1798. I suspect the subsequent large composite etching, The Manual and the Ten Divisions of the Highland Broad Sword released the following year, with its numerous and intricate illustrations by Rowlandson, was necessary for detailed and accurate reference of form suitable for training the Light Horse Volunteers. 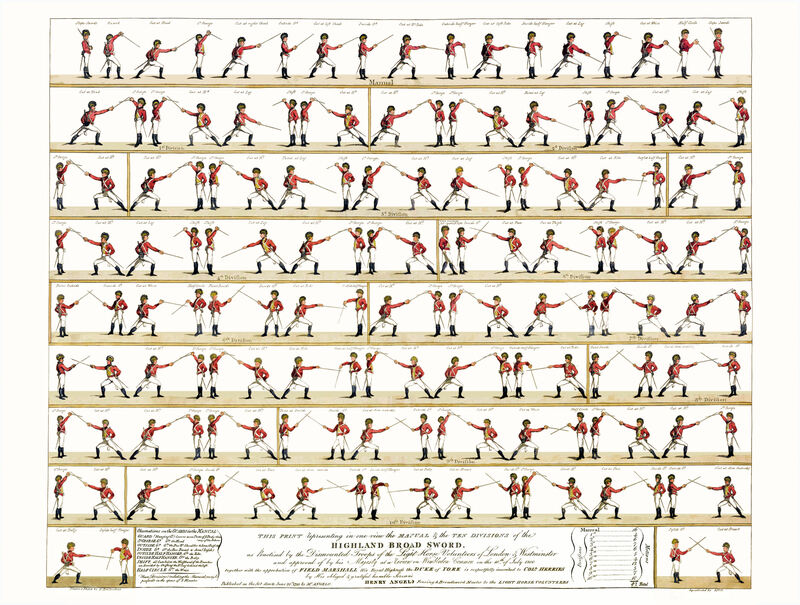 Image of Angelo and Rowlandson’s 1799 composite plate, as available full-size on the Web. As you can see, the small size and low image resolution result in difficulty discerning Angelo’s sabre system in detail. A slightly larger and aquatinted version of the same composite plate, as available full-size on the Web, courtesy of Princeton’s Graphic Arts Collection. Although larger, the necessary image detail for a practitioner is lacking. One of the few image details (at full size) available on the web before image restoration. After image restoration. Click to see at full resolution. Image editing by Nick Thomas of the Academy of Historical Fencing. After image restoration by Nick Thomas of the Academy of Historical Fencing. Click to see at full resolution. Undoubtedly, the improved image quality and size of Angelo’s The Manual and the Ten Divisions of the Highland Broad Sword will prove quite useful to the aspiring practitioner. It can be downloaded via the image below; click to view full-size then right-click to download (3mb). 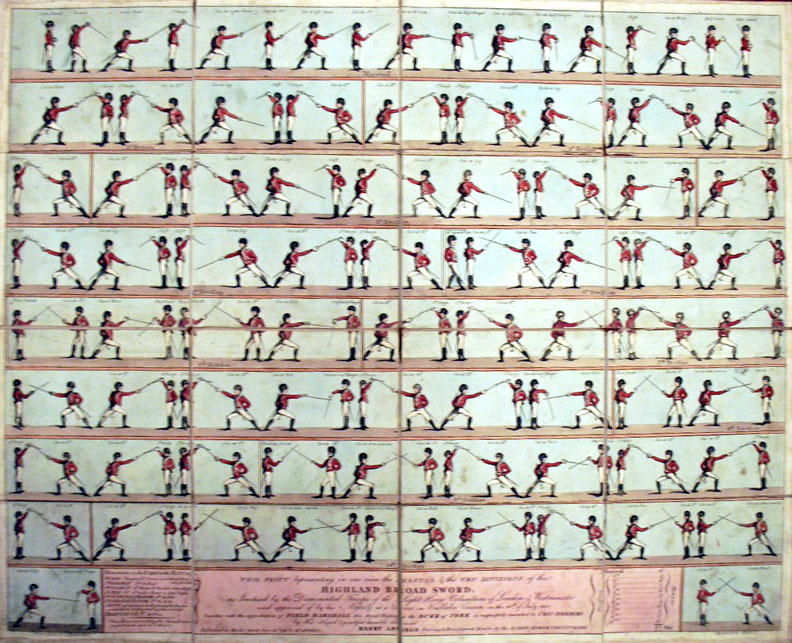 Angelo & Rowlandson’s Manual and the Ten Divisions of the Highland Broad Sword (1799), with image restoration by Nick Thomas of the Academy of Historical Fencing. Click to download full-size (5310 x 4016, 3mb). 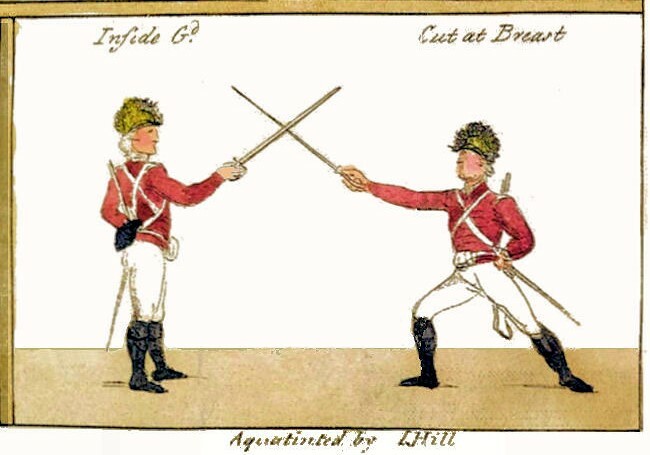 If interested in seeing more of Angelo’s approach to the broad sword as illustrated by Rowlandson, his twenty-four plates comprising Angelo’s Hungarian and Highland Broad Sword can be be downloaded here (26mb), courtesy of Peter R. Valentine (digitally sourced via The Association for Renaissance Martial Arts TheARMA.org). Angelo, Henry & Son. (1798), Hungarian ans Highland Broad Sword. Thomas Rowlandson, Illustrator. Peter Valentine, Transcriptionist, 1999. Retrieved from TheARMA.org. Mirrored by Columbia Classical Fencing here. This entry was posted in Artwork, Weapons and tagged 1799, 18th Century, Angelo, Aquatint, art, basket hilt, Broadsword, English, Etching, Henry Angelo, Highland Broad Sword, Light Horse Volunteers, Rowlandson, saber, sabre, Scottish, Thomas Rowlandson. Bookmark the permalink.